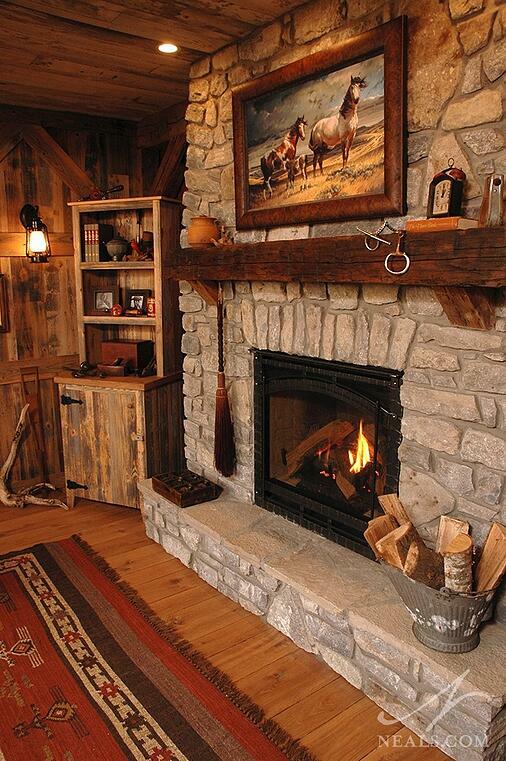 Today, a fireplace can be added to almost any room of the house where you want warmth, comfort and ambiance. Wood, gas or electric fueled fireplaces are versatile in size and structure and can make a design statement. Here are several fireplace design ideas from our portfolio of remodeling projects for homeowners in the Greater Cincinnati area. Taking advantage of this room's ceiling height, this fireplace shares the spotlight with the back-yard view. In tight spaces, it can be tempting to skip the fireplace to make room for windows or to have a space for the TV. It doesn't have to come down to that, however, if you design the fireplace around your other needs. In the room above, windows are given the majority of space in the tall walls of this hexagonal room, making the loss of one wall for the fireplace less of a impact. The stone surround extends all the way up, but the fire unit itself is small in scale (and appropriate for the size of the space), leaving plenty of space about for the TV. 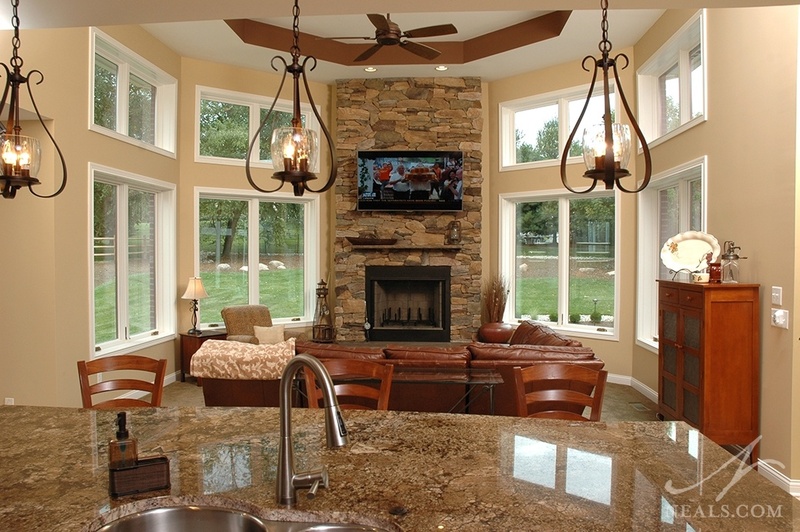 The result is that the fireplace, view and TV play nicely together, without detracting from each other. In this living room, the fireplace is just one component to a feature wall containing several design solutions. In many modern homes, the living room has been the primary location for the fireplace. 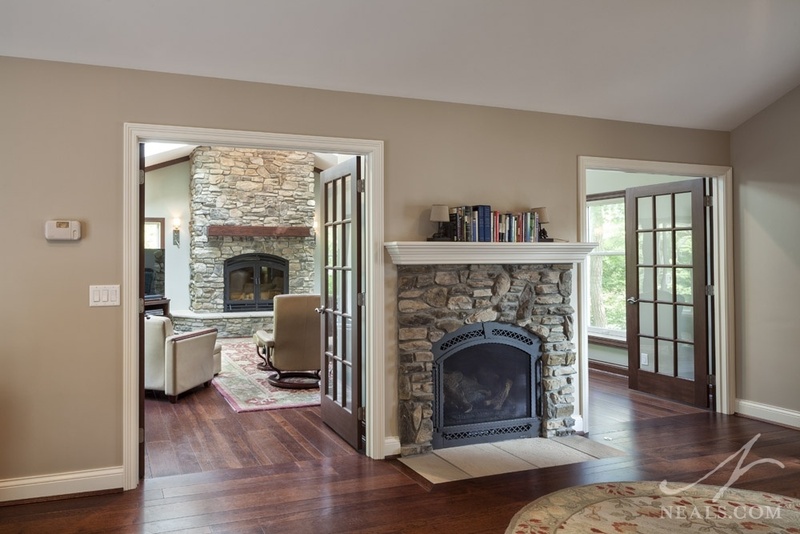 A fireplace can be a decorative element that complements the home’s architectural style - either formal or casual. In the living room above, a large window wall with French doors dominated the room. To balance the windows, the far end of the room was remodeled as a feature wall, the heart of which was a new fireplace. To make the most of the space, the wall includes all the storage for the living room, leaving the rest of the room for comfortable seating and tables. 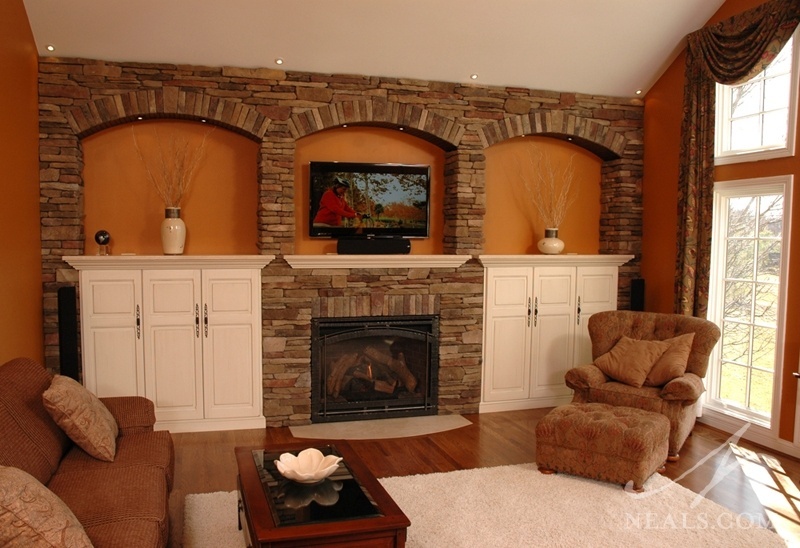 While the TV gets pride of place above the fireplace, the other stone archways offer display shelving. 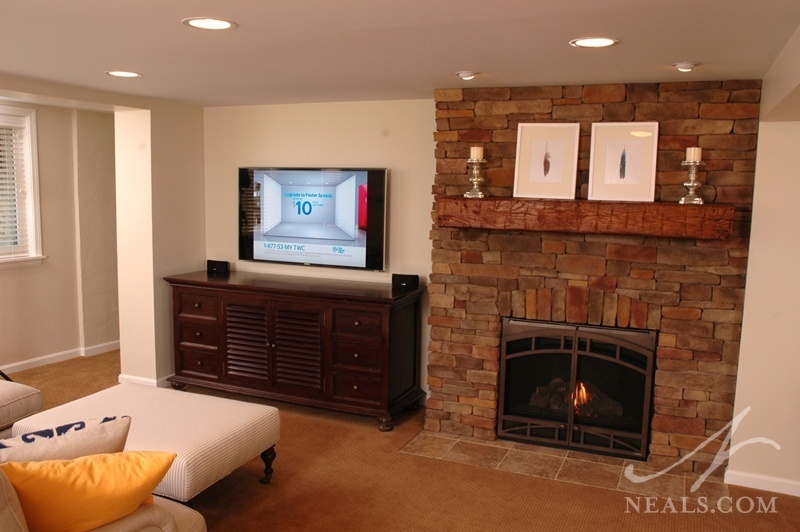 The fireplace in this basement sitting room shares the wall with the TV by taking up just one corner of the large niche space. Some fireplaces benefit from horizontal scale, taking up a large amount of the space along a wall, but in many cases, homeowner's are looking to add fireplaces to spaces with functions that are already dictated to other things. 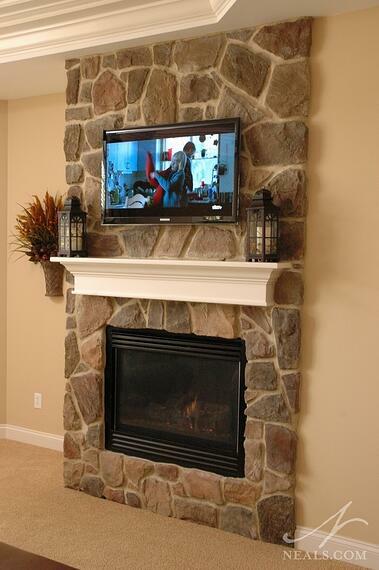 In the 90's, a corner fireplace was the solution, since it did not take up as much valuable wall space. These days, however, with a greater interest in natural stone facades and chunky fireplace mantles, the corner solution has changed. Now, designers are recognizing the potential in wall jogs- spaces where a wall is pushed back from the main wall, creating a shallow corner. 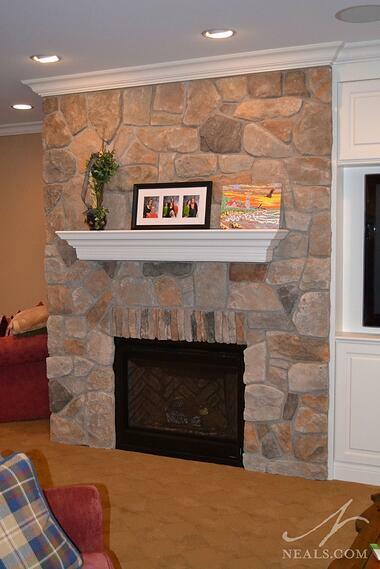 This new kind of corner fireplace, like that pictured above, isn't set at an angle, but rather becomes an extension of the wall. These two similar stone fireplaces are situated on a corner, facing the main space, providing the atmosphere of a fireplace without taking up a large footprint in their respective rooms. In the home pictured below, the original living room was converted into a multi-use hall space on the way to a new room addition. There was already a fireplace on the wall, so rather than remove it, it was refaced and flanked by the doors into the new living room. The solution creates a grand entrance wall into the addition, and allow the large hall to retain the cozy ambiance of a roaring fire. The fireplace in the foreground here was refaced to tie it into the new look of the remodeled home, and functions like a casual piece of furniture on the way to the new, more formal living room. When you're considering a themed room, such as the rustic barn-inspired room below, and a fireplace makes sense with your goals, it's important that the fireplace fully suits your theme. 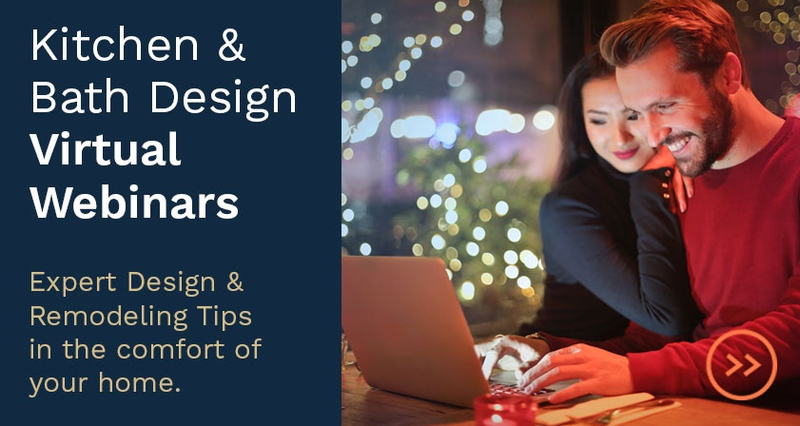 This is because the fireplace becomes a major focal point in a room, and if it's just a little "off", it will mar the effectiveness of your theme. The stone in this rustic fireplace was arranged in various directions to look as though it was built from rocks gathered around the property of a secluded country cabin. A reclaimed wood beam provides the mantle. The fireplace below was designed after a typical English cottage hearth. Part of an expansive English tavern-themed basement remodel, the fireplace had to convey the old-world style needed to successfully transport the homeowner's guests to fully immerse into the English experience. A niche in the stone surround, a long, low wood mantle, and Victorian-inspired gas fire unit were combined to carry the theme in this room. 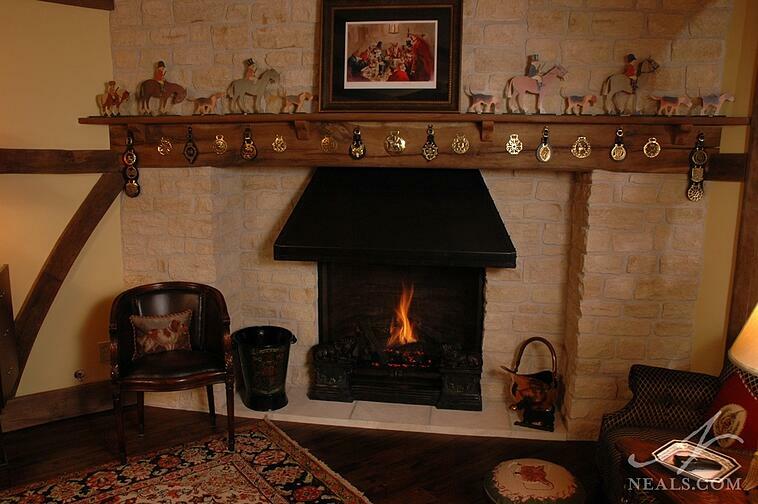 The homeowner's collection of horse medals and traditional English hunting scenes make full use of the wide mantle, and help make it difficult to believe this fireplace exists in an American home.